Cloud is now a basic business requirement; every business in some way or another is harnessing the power of cloud to succeed. Some may choose in-house infrastructure or a private cloud environment, while others prefer public cloud offerings. The fact still remains that companies are relying more on their cloud vendors now more than ever for providing the best services at reasonable rates. However, all too often, that’s not always what’s delivered. Here are some points to keep in mind while you deal with a cloud vendor in order to get the best deal for your corporate assistance. Uptime statistics define the time that a cloud service is accessible to its users, those who have subscribed for the cloud provider’s services. Companies often claim that they rarely have outages or they are better in uptime statistics. Don’t let these claims go unchecked. A lot of cloud providers fail to deliver a good uptime, in other words, are not giving to the customer three nines (99.9%) of availability. 99.9% uptime means 9 hours of unscheduled downtime per year which does not count the scheduled downtime that the companies organize for maintenance purposes. Along with availability, it is equally important to have a good response time warranty, i.e., how fast the system is operating when it is up and running. It is of utmost importance to get detailed statistics before signing up with a vendor. Cloud vendors pretty much offer more or less the same support levels with few alterations with names like ‘standard’, ‘essential’, and ‘ultimate’ packages. These packages often do not give detailed information as to how much support each level guarantees. Always remember to ask your vendor a full description of these support levels and specific examples and whether these situations would be covered in the support or not. It is advisable to get the guarantee in the form of an agreement to serve as a record if at all required in the future. In case of an issue, you must have a designated point of contact with the vendor, who can resolve it. Many companies try to get past this by introducing a ticketing system. ‘Tell us your problem, and we’ll get back to you when we have a fix’, is an example of a pop-up message and is very common in the industry. A Designated POC would be an ideal alternative to such a message in order to address the issue at hand immediately and to make sure the right people are working to resolve it. Cloud vendors may try to get an initial long-term contract with lock-in periods varying from months to years and often levy early termination charges. While choosing a cloud provider it is important to evaluate the Separation Agreements in place. While separation maybe the last thing that comes to mind while choosing a vendor, it is still one of the most important things to consider. It may also be crucial to inquire whether the vendor has the capability to retain your data even after your contract has ended with them, in order to avoid any possible data breaches. SLA is the commitment on availability levels and performance of services offered. There are no specific standards to an SLA and thus it varies from provider to provider. Higher the price of the service, better the performance guaranteed, and this is usually negotiable. It is important to go through the verbiage of an SLA to clearly define vendors accountability and service assurances and choose the best plan according to your requirement with matrices that offer discounts on billing and other penalties if it is breached. Last but not least, once you have finalized a provider, do not stop looking for better alternatives. Be up to date with the market and what other providers are offering. If your service doesn’t match with the current market trend, be sure to ask your provider for an updated service and also, for them to inform you about changes in terms and conditions, if any, while your service is still intact with them. Getting the right cloud vendor is essential for a company’s overall growth. 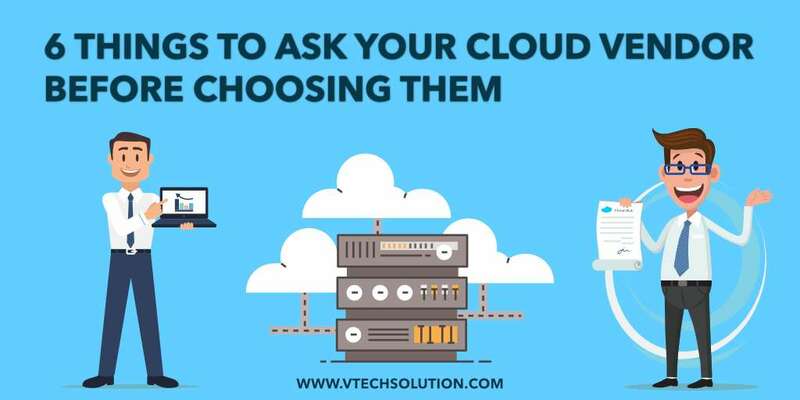 Keeping these checks in mind while evaluating your options will not only help you to find the right cloud vendor but also let you manage your company’s operations unhindered and with peace.